I’m not a big BBQ enthusiast, so I was a little worried when I saw this month’s MiniMoFo theme. And then Dr HH saved me by taking me on a trip to The Warehouse Cafe in Birmingham and ordering the BBQ burger! What a champ! The cafe is located on the first floor, and just next door to a very well-equipped vegan shop which is well worth visiting. 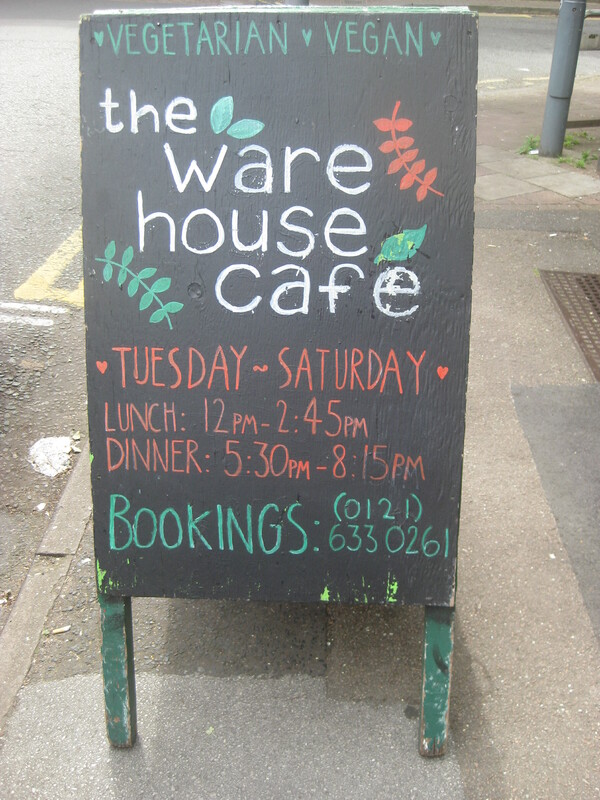 The cafe got busy pretty quickly at lunch time, so booking might be a good idea if you’ve got your heart set on it. There are five or so options each for small plates/starters, mains and desserts, plus daily specials. 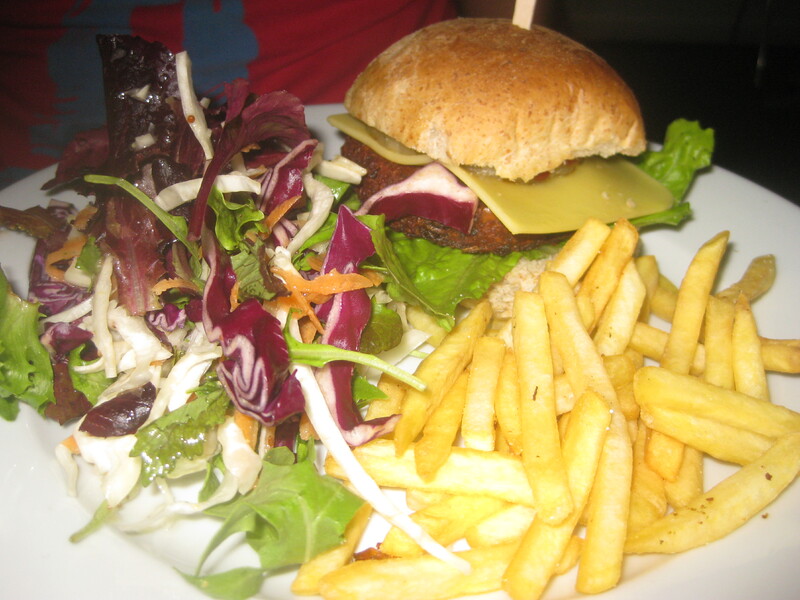 Most things are vegan or veganisable, so there’s plenty to eat, and the menu offers tasty things like curries and burgers. We only had eyes for the burgers. Dr HH ordered one of the daily specials: the BBQ burger, which was the regular patty (more on that later), topped with cheese, a grilled pineapple slice and lashings of BBQ sauce. He really enjoyed it, saying it was full of flavour and goodness. 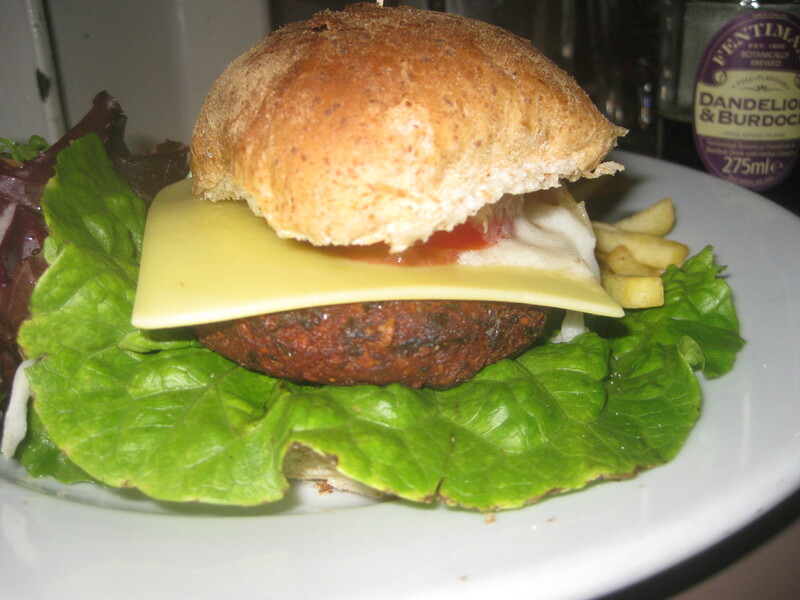 I played it safe with the regular burger: a patty made of sunflower seeds, quinoa, butterbeans and spinach, and topped with cheese, tomato and caramelised onion. It was my kind of burger, because it was actually quite dry – I really hate sloppy or over-stuffed burgers that are difficult to eat. 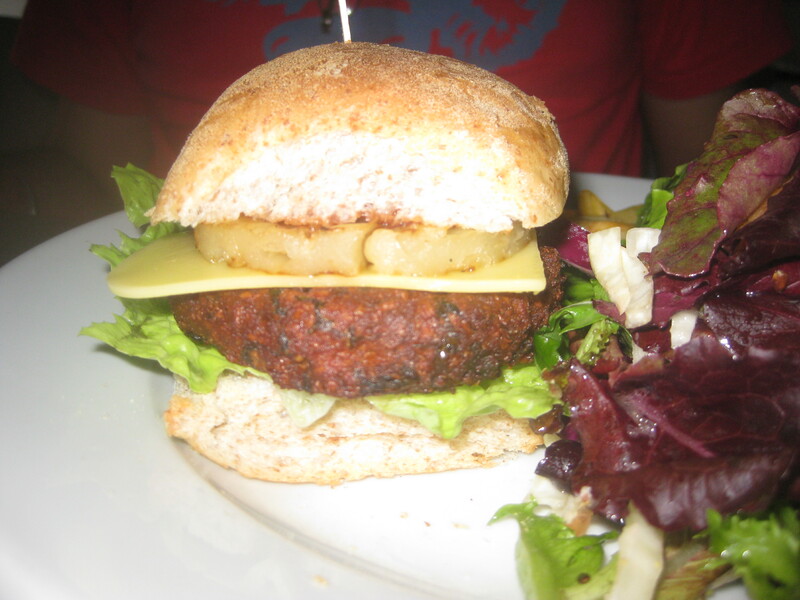 The patty was so good – a great texture and plenty of flavour. Although we both loved our burgers, we felt they were a bit overpriced at almost £10 each. The burgers themselves were a little small, and there was a lot more salad on the plate than I would have liked. The desserts were definitely worth the price, though! 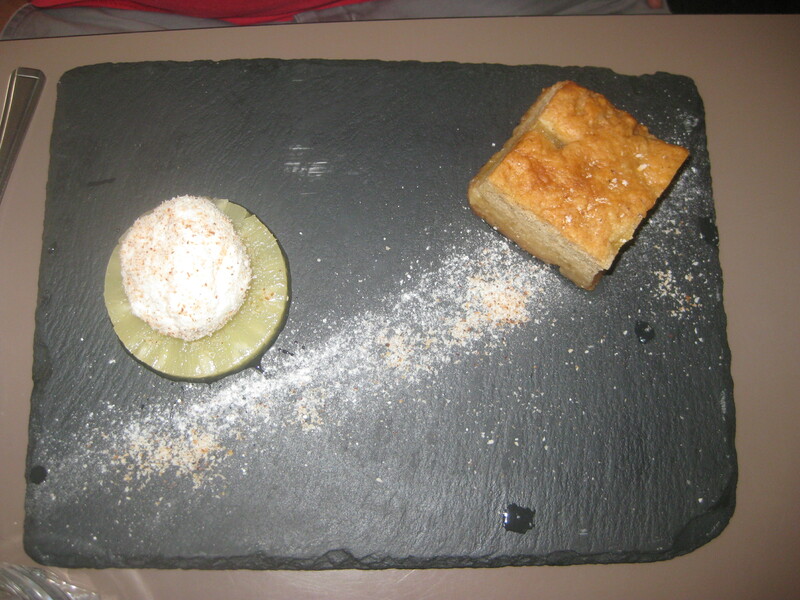 Dr HH got the pineapple and coconut cake, served warm with ice cream rolled in toasted coconut. Oh la la! The cake had a good bake and the flavours were quite subtle, but pleasantly sweet and delicious. This brownie is one of the greatest brownies I’ve ever tried! It was also served warm, making it extra gooey and lovely. 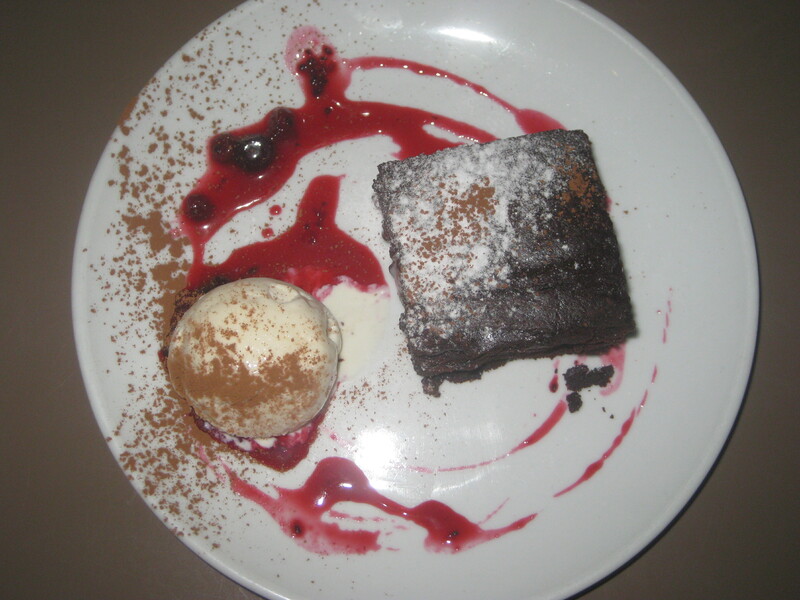 In my experience it’s quite rare to find a genuinely dense and fudgy brownie, so this was a real treat. I’d eat it again right now if I could! 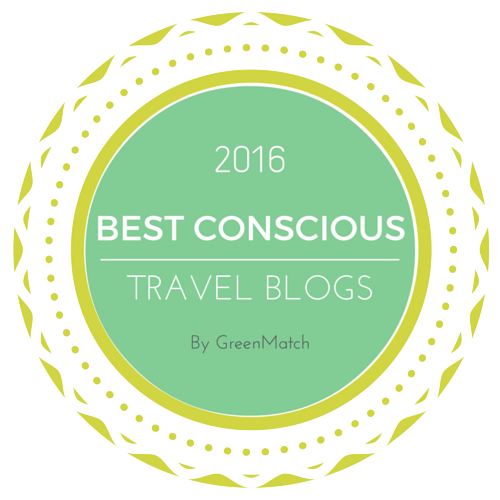 This entry was posted in Travel and tagged The Warehouse Cafe Birmingham, vegan Birmingham, vegan travel. Bookmark the permalink. I know the theme was BBQ and the BBQ burger was the star (you don’t see pineapple on burgers often enough), but I’m looking at the cakes and drooling. The cakes truly were sensational! I don’t really like pineapple in savoury dishes, so I’m actually glad that’s not so common! 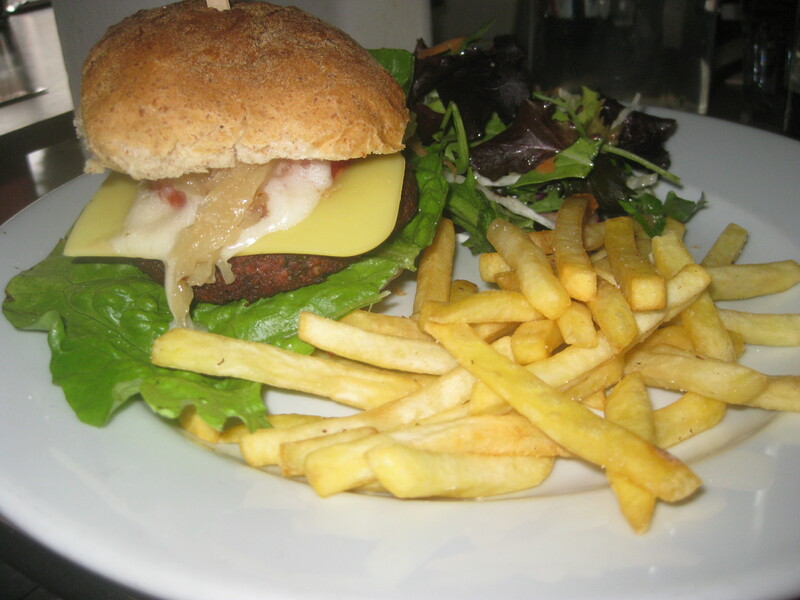 I think that I’d have gone for the BBQ burger too, cheese + pineapple is so fun and not something you see everywhere. I forgot that it’s such a popular combination – every party I went to as a kid had those cocktail sticks with cubes of pineapple and cheese! I always play it safe with burgers!